This blog post is by one of my real-life friends, and I am SO happy to have her here today. Her words are so beautiful, and she honestly shares things a lot of us mamas have experienced. I found myself smiling and nodding through her entire post! I hope you love it as much as I did, and find your way over to her blog or social media profiles to say ‘hi’! I saw a coffee mug the other day that said “World’s Okayest Mom” and it made me chuckle. I’d honestly feel way more comfortable carrying that mug around than a mug proclaiming myself as the “best” mom. I know, I know…I’m the best possible fit for my own child. I intuitively know his needs better than any other person. We have a bond that surpasses even the best brand of super glue. I get it. I’m the world’s okayest mom and some days I’m doubtful that I even reach “okay” status. But that is where I find the Lord. In my doubts. I find Him when I’m unsure of what I’m doing. I need the Lord and He knew that long before He knit together this precious boy in my womb. And woven into my own life are threads of His grace that carry me along and keep me humbled in the fact that the Lord is able to do so much more in my waiting than I can do in my doing. Oh, how I need Him. I need Him more and more with each new day that He gives me to be the mother of this child that He has allowed me to raise, despite my innumerable shortcomings. I’m a mom, a wife, a house cleaner, a dishwasher, and a laundry folder. I’m a boo-boo kisser, a storyteller, and the opener of all things my toddler can’t open himself. I’m a gold medalist at holding the feet of my wiggling toddler with one hand while opening up a pack of wipes with my other hand…all without getting a bit of poop on the couch or myself. I’m a cook who can measure out, chop up, and mince all of my ingredients for dinner and cook them accordingly while simultaneously singing “Airplane, airplane high up in the sky”(I’ll spare you the rest of the lyrics). I’m an animal lover who can catch toads with my bare hands, not because I’m particularly fond of its pee running through my fingers, but because my Little Man wants so badly to catch one and feel it with his own hands. I’m not the best, but I’m okay with that, because the Lord’s grace is sufficient and His mercies are new every morning. To that, let’s raise our “World’s Okayest Mom” mugs high and celebrate all the precious days we have with our little ones, because each day with them is a gift, no matter how well we handled it. Alicia is known as “The Mrs.” over at her blog, A Sweet Fragrance, where she chronicles her memoirs, projects, recipes and lessons learnt while living life abroad and serving Him in SE Asia. 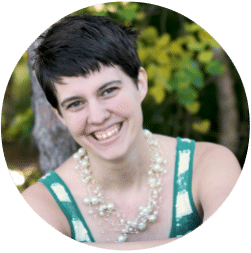 She is a wife, a mommy, a writer, and a lifelong language learner who loves keeping busy with her camera and DIY projects. She blames and also thanks her husband for turning her into the coffee snob she is today. You can also find her on Twitter, Pinterest, and her newly created Facebook page. From one okay mom to another… it sounds like you are doing your best, and no one can ask you to do more… sounds like your boy is a lucky baby! Thanks so much, AJ. Being a mother is definitely a humbling experience. Thanks Mary. If only we could go get some coffee together with our “World’s Okayest Mom” coffee mugs ;-) And thank you for saying hey to me over on Facebook! Thank you so much for those words, Beth. I just clicked to see your page and I was immediately intrigued by your blog’s title. I’m already anxious to read more! I like that phrase too. :-) Makes us all feel right at home because we can relate so much easier to okayest than to best. Thanks! I love that idea of being ‘okay’, It means I surrender to the crazy and work with it. Who can’t love that?? I love people who can own up to their own ups and downs and not belabor either point. It is what it is, and that’s fine! Boo-boo kisser is a BIG job!! 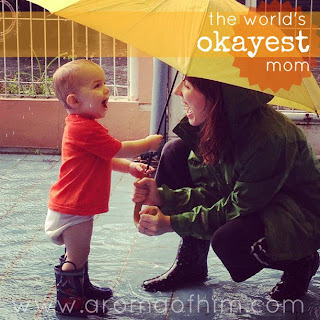 I LOVE this post and definitely need to find myself an “okayest mom” mug, too! Being the “okayest” takes so much pressure off trying to be the best and perfect. You sound like an awesome mom to your little man and I’m off to check out your blog :) Thanks for sharing! Thanks Amy! I do feel quite a sense of relief when I realize that there’s really no glory in being the best mom. Plus, who wants to talk to a mom who already knows it all anyway? Thank you for visiting my blog! I’m not a mom yet, but I see so many women getting upset and discontent with their roles because of comparison and being critical towards themselves. I’m okay! And that’s great! Thanks Dolly! There’s so much truth to the quote, “Thief is the comparison of joy”, isn’t there? I like your outlook. When you are alone with a toddler all day, O.K. is about the best you can hope for. Hi, Elizabeth! I just now saw your comment. Lack of adult interaction each day does kind of wear on you, doesn’t it? ;-) Thanks for reading and leaving a comment! This is such a great post! It is very refreshing to read about other mothers that just feel “okay”. 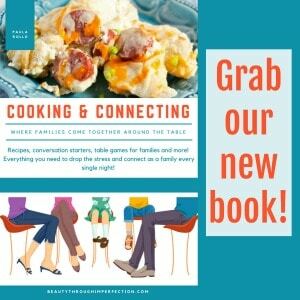 Hey Buddy!, I found this information for you: "Meet the World’s Okayest Mom". Here is the website link: https://www.beautythroughimperfection.com/okayest-mom/. Thank you.